The Fiji Women’s Crisis Centre is the only organization raising awareness on violence against women as a human rights violation. This is done through its extensive community education program as well as through the community awareness and training for government agencies like the Department of Social Welfare, Police and the Military. A comprehensive training module has been developed by FWCC and is used in various training packages locally as well as regionally. International Human Rights instruments like the Declaration on Violence Against Women and CEDAW are used as lobbying tools to advocate for positive changes in Government policies. FWCC has also encouraged the members of the Pacific Women’s Network Against Violence Against Women to report on their countries progress in regards to issues on violence against women and to submit the reports to the UN Special Rapporteur. 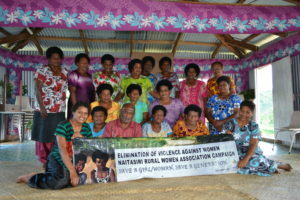 The Pacific Women’s Network Against Violence Against Women which is made up of 33 organsations in 11 different countries resolved in their last meeting (February 2001) to bring advocate for more effective changes in terms of legislation and the ensuring of the human rights of women and children who are victim/ survivors of violence. FWCC and the Pacific Women’s Network have tried to advocate for this view to be included in programs run by regional governmental bodies like the Secretariate for the Pacific Community (SPC) and the Pacific Islands Forum Secretariate.